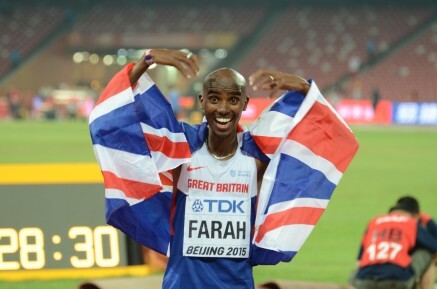 22nd August 2015 – The first day of the IAAF World Track and Field Championships in Beijing, China, saw Mo Farah (GBR) retain the 10,000m title. In recent times some of Farah’s rivals have been accused of playing into his hands and leaving the race down to a sprint finish. That was not the case this time though as the Kenyan trio of athletes worked as a team to try and break Farah and run his kick out of him. After passing halfway in 13:40 they continually traded laps of 64-65 seconds and whittled the lead group down to 5 as PACE teammate Galen Rupp (USA) also ran with them stride for stride. Whatever was thrown at them Mo and Galen had all the answers before Mo swept into the lead with 500m remaining. With 350m to go an accidental clip of his heels almost sent Mo crashing to the track but he kept his balance and composure to continue to wind up the pace. Unfortunately the incident affected Galen more as his momentum was lost and a gap opened. Mo continued to gradually build his speed as each 100m passed and his final effort as he entered the home straight saw him move clear and cross the line in 27:01.13. Galen crossed the line fifth in 27:08.91 and was also followed by Ugandan Timothy Toroitich (UGA) who had his best performance at a track World Championships placing eighth in 27:44.90. Usain Bolt (JAM) began his World Championships campaign by winning his 100m heat in 9.96 seconds. In the morning session there was smooth progress from the heats of the womens 1500m as Nancy Chepkwemoi (KEN) and Shannon Rowbury (USA) literally followed each other across the line in heat 1 in automatic qualifying positions. Michael Rimmer (GBR) narrowly missed out on progressing from the mens 800m heats but after missing all of his winter training can take positives from his performance.